Like the Blue Label, the Gold is a blended scotch made with some of the most exclusive single malts Scotland has to offer. Originally created by Sir Alexander Walker in 1920 to celebrate 100 years of the Johnnie Walker brand, the Gold Label is comprised of at least 15 different single malts, all at least 18 years old and some many years older (although reportedly the Gold blend is sometimes bottled with the youngest scotches being 15 years in age). While not nearly as expensive as the Blue Label, which can cost as much as $200 per bottle, a 750 ml. bottle of Johnnie Walker Gold Label will normally run $70-80. Like the Blue Label, the Gold challenges the commonly held notion that single malts represent the pinnacle of scotches. As soon as you open the bottle you are struck by two things: the deep golden color and the incredible aroma which I enjoyed for a full 20 minutes before I even indulged my taste buds. I found the aroma to be an inviting mix of apricot, orange peel, and honey. When I finally got around to sipping this golden whiskey, I found some rich fruit and vanilla with a lingering honey and subtle smoke and spice. The finish is delicate but long. According to the Johnnie Walker website, the Gold Label blend is best enjoyed out of the freezer allowing for the flavors to come to life on the palate as it warms in your mouth. I tried it both at room temperature and frozen, and found their description accurate. However, the downside of the chilled whiskey was that it somewhat muted the fantastic aromas that were produced when I enjoyed the Gold Label at room temperature. With such a glowing review, you won’t be surprised to find that this scotch is best enjoyed with a fine cigar, and most fine cigars will go very well with a Johnnie Walker Gold Label. 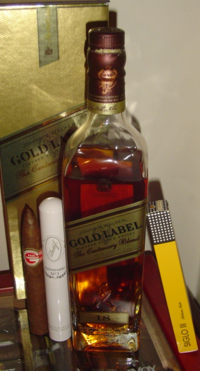 My recommendation would be to avoid the extremes when pairing the Gold Label with a cigar, so avoid the most mild and most full-flavored smokes. I enjoyed this with a Davidoff Special R, which I would classify as medium- to full-bodied, and the pairing was excellent. An Ashton VSG or Arturo Fuente Sun Grown are two others that come to mind as excellent pairings, though I would be weary of trying to match a maduro with the subtle honey flavors of the Gold Label. Overall, the Gold Label is an excellent, complex scotch that will pair well with a variety of cigars. While not as exquisite as the Blue Label, it punches above its weight at nearly a third of the price and is a must try for anyone who enjoys whiskey with their cigars. I have been experimenting lately with cigar and booze pairings and have found that the new Macanudo 1968 goes quite nicely with a tumbler of Zaya rum on the rocks. Hopefully one of the stogie guys will review this pleasant new stick. I was pleasantly surprised with this latest offering from Mac. Furious: I'm a big fan of Zaya rum, to which I was introduced by someone's comment on this site a few months ago. It's a bit sweet for my taste, but the sweetness works really well. For what it's worth, Zaya makes an excellent, if uncharacteristically dark-colored mojito. Patrick: Nice review! I'm a Scotch man through and through, and it's nice to see blended Scotches getting the respect they deserve in your reviews. That said, the whole serving-chilled thing is news to me. Is that really what they recommend? I'll have to give it a shot. I was always taught that top-shelf Scotch should be served room temperature and neat. I wouldn't dream of arguing the point of how good this particular Scotch is…I've never had it so I can't speak to that point. What I would challenge is the sentence: "Like the Blue Label, the Gold challenges the commonly held notion that single malts represent the pinnacle of scotches." While I'm sure this blended Scotch is just fine, does it really represent the "pinnacle of Scotches" when compared against wonderful single-malts that are either much cheaper (Laphroiag, $30-35 per bottle for the regular 10 year, $50-65 for either the cask strength or 15 year) or around the same price (Lagavulin, $70 for 16 year)? Seems like to produce a truly world-class Scotch, JW needs to charge far more than a comparable bottle of single-malt. I'm not much of a Scotch drinker anymore, but for an absolute flavor sensation at a relative bargain, I'll stick with Laphroiag. My comment on blends vs. single malts wasn't meant to denigrate single malts so much as elevate blends. My point is, the widely held notion that blended scotch is second class to single malt is silly. Interestingly, while prevalent in America, the Scottish are not nearly as likely to hold such biases against blended scotch. Famous Grouse happens to be my favorite blended Scotch (and Macallan one of my favorite single malts). Single malts got their elevated status here in the States thanks to decades of very selective marketing. As you've said, in Scotland itself they don't turn their noses up at blends. That doesn't make an excellent single malt Scotch any worse; it just means that we should also make room on our pedestals for the best blended Scotches. I guess my beef is that the "magnificent" blended Scotches are significantly more expensive than any comparably "magnificent" single-malts. Blends may well be very tasty, but you should expect to pay much, much more to find one that is. I enjoyed Johnnie Walker Golden Label this sunday 15.02.2009, at the pre Polo Match luncheon hosted by Golden label catering by Radisson Hotels. The Whisky had a smooth taste with rich aromas of fruit and went well with cheese and Oyster. Nice compliments fro the Organisers. Thanks for inviting and would look for the next invite.